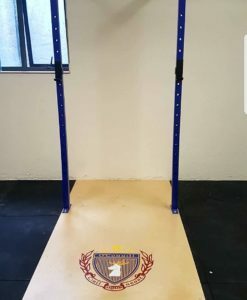 When it comes to strength training, personal trainers, coaches, and fitness professionals can all agree on one thing - a dependable weightlifting rack is essential. Since it allows complete freedom of movement, users can - regardless of their fitness level and training experience, to perform a wide range of different weight lifting exercises in a safe and secure way. So, load up on some weights and start working hard, making the most of the versatility which FEI’s squat racks, power racks, and weightlifting platforms provide. Simply put, a squat rack is a piece of gym equipment that has been designed with the squat movement in mind. When you’re performing numerous variations of squats, the squat rack supports your weight. 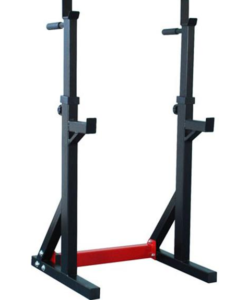 Affordable — Squat racks are less expensive than power racks, which makes them affordable products. Space-saving — Squat racks are relatively compact, which means that they can fit into a corner of your home gym. Also, they take up less space than a power rack. Increased mobility — Since they aren’t very heavy, squat racks are pretty mobile. You can move them to a new location easily, which is more complicated to do with a power rack. 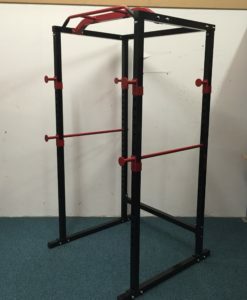 A power rack is a piece of gym equipment that provides maximum safety while performing lifts since it allows for free weight training, even without a spotter. Also, all power racks are equipped with safety pins to catch the barbell if it slips. What’s more, power racks have built-in dip and pull-up bars, which allows you to also perform a number of other exercises. Value for money — Buying a power rack is a one-time investment, which can provide you amazing workouts for years. If you love training with heavy weights, a sturdy and robust power rack is a must. Safety — With a power rack, you can work out on your own without worrying about injuring yourself or damaging your equipment. Since you can bench and squat without a spotter, you have more freedom. Versatility — Apart from being able to do many types of rack squats, with a power rack you can also perform deadlifts, inverted rows, bench presses, barbell curls, chin-ups, as well as a range of other movements. As such, our power racks and squat racks are ideal for fitness clubs and gyms, as well as for home use.